Part of my 'One more cup of coffee' collection, with a muted colour palette in stone, tan, cream, white and black, this throw will look fabulous in any home. Using my own unique design the quilt has been pieced using high quality cotton. Quilted in an orange peel design using luxurious Italian cotton thread in copper. 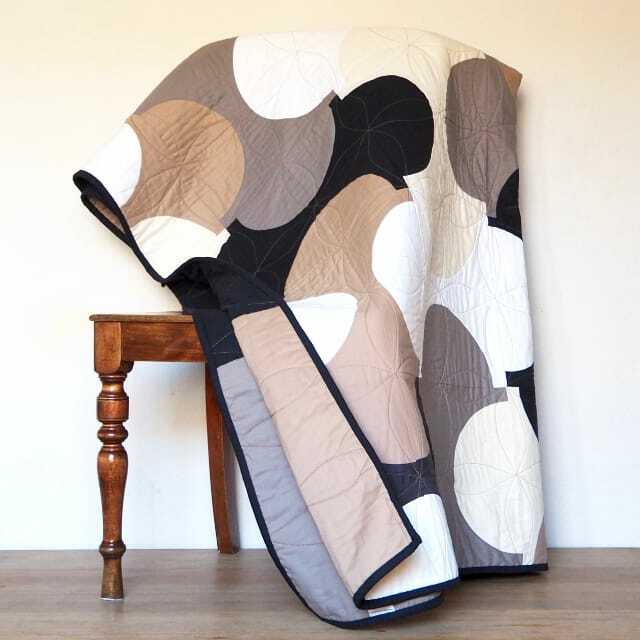 The quilt back uses large fabric panels in the same fabric colour as in the front. Each backing will vary depending on fabric panel placement. My quilts are made to be used and loved. They are washable on cool gentle machine cycle. Constructed fully from high quality cotton allows for easy care. I would advise using a colour catcher or two on the first wash. Line dry or tumble dry on cool. Iron flat. 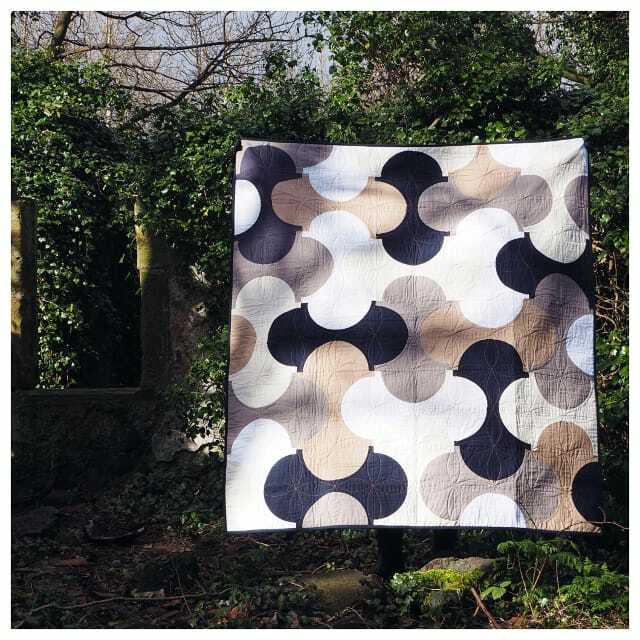 SkinnyMalinkyQuilts was founded in 2014 by award-winning printmaker Lucy Engels. She creates luxury home ware that is known for it's colourful sophistication and high quality. Every quilt is unique and original using only the best quality fabrics and wadding. They are machine pieced and quilted, with each being finished by hand. I have always been creative and studied fine art and printmaking. Since leaving art school I continued to make, mainly knitting and crocheting. In 2013 after becoming an Auntie for the first time I wanted to make a special gift for my first nephew. Something he could use every day and keep forever. A Quilt! And so a passion for making quilts was realised. I embraced the process which I found was unexpectedly similar to printmaking. It has to be exact, layers create the final quilt, texture can be added to create dimension. I love being able to use amazing fabric lines in my work, playing with a sophisticated palette whilst enjoying bold combinations. I also screen print my own limited edition mini collections of fabric to use in my home ware. My pieces are as individual as the people I make them for and I strive to create high quality heirlooms that can be enjoyed for years to come. I love colour and enjoy unexpected colour combinations in my work. 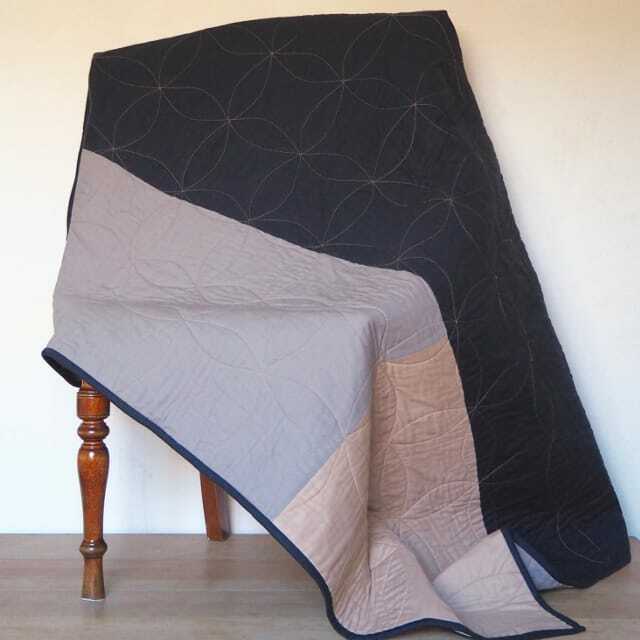 Using traditional quilting techniques I combine shape, pattern, colour and quilted texture to create unique pieces. The inspiration for the colour schemes happen organically. I find myself being drawn to a colour for a period of time and finding other colours to compliment and contrast through trial and error. My mini fabric collections change quarterly. Each collection has a different subject matter and is made up of three designs in five colour ways. I hand draw every separation using pen and ink, then screen print the collection by hand. Being a printmaker at heart I wanted to retain the limited nature of the print edition. Therefore my handprinted fabric panels are only available during the print run. Any remaining panels get used in my homeware.